நேபாள மார்வாரி பிராம்மண சங்கத்தின் ஆண்டுவிழாவில், பரசுராமன் பிறந்த தின கொண்டாட்டத்தில் பிரசண்டா, பட்டாரை ஆகிய "தோழர்கள்" (தற்போது மாவோயிஸ்டு வேஷம்) கலந்துகொண்டுள்ளனர். சத்திரிய ராஜாவின் ஆட்சியை அழித்து பிராம்மணர்களான பிரசண்டா, பட்டாரை போன்றோர் பெற்ற வெற்றியை. சத்திரிய ராஜாக்களை அழித்து பரசுராமன் பெற்ற வெற்றியோடு இணைத்து கொண்டாடி மகிழ்ந்துள்ளனர். சந்தோஷத்துடன் இதனை ஆமோதித்து மேடையில் அமர்ந்து புளகாங்கிதம் அடைந்துள்ளனர் மாவோயிஸ்டுகள். Bangalore: Fearing the rise of Brahmin Prachanda, the maoist chief of Nepal, who is dreaming of seizing control of Nepal and becoming its dictator, the Nepal’s oppressed Dalits and Backward Castes have launched a powerful anti-Brahmin revolt. Madhesi movement on the border of India is leading the anti-Brahmin revolt which has gathered big support from the Himalayan country’s 100 and odd indigenous caste groups who form the overwhelming majority ruled by a tiny Brahmin and Kshatriya (called Chatteri in Nepal) jatis. Recently the Madhesis killed scores of maoists because Prachanda unleashed his moist mercenaries to attack them. 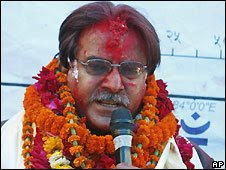 Beef-eating Brahmin: Prachanda eats beef — prohibited for Hindus — but drinks cow’s urine like all orthodox Brahmins. The Madhesi movement is led by a powerful Backward Caste leader, Jwala Singh, himself a maoist but fallen out with Prachanda for hating the Backwards. Almost all ethnic movements of Nepal are anti-Brahmin and anti-Prachanda. Prachanda is planning to seize power in a coup encouraged by the Brahminical leadership of the Indian maoists. If ever he seizes power and takes over as the president of Nepal, the maoists of India are expected to launch large-scale violence over India. Brahmins and other upper castes are leading the Indian maoist parties. BJP support maoists: In the West Bengal anti-SEZ violence, maoists took a leading part and the Hindu terrorist party (BJP) supported this violence though it fully favours SEZ and entry of foreign business into India. As both the Hindu terrorist party leadership and maoist leadership are Brahminical they have close connections with Prachanda and are waiting for him to seize power in Nepal. If and when this happens BJP, maoist party and even the marxist and other political parties will all join to welcome Prachanda and impose their Brahminical dictatorship over India. DV Feb.16. 2007 p.7: “Admiring Nepali Prachanda but killing Indian naxals”. DV Dec.16, 2006 p.9: “Naxalism will zoom if Brahmin Prachanda becomes president of Nepal”. DV Edit May 16, 2006: “Red star over India: Danger of manuwadi marxists further enslaving starving Dalits”. டிமாண்ட் அண்ட் சப்ளை விஷயம் இதிலும் வேலை செய்யும். அதிகமாக வரி விதித்தால் குறைவான பணமே அரசாங்கத்துக்கு கிடைக்கும். ஏனெனில் குறைவான மனிதர்களே உண்மையில் வரி கட்டுவார்கள். குறைவான வரி விதித்தால், நிறைய பணம் அரசாங்கத்துக்கு கிடைக்கும். ஏனெனில் நிறைய மனிதர்கள் குறைவான வரியை கட்டிவிட்டு நேர்மையாக இருக்கவே முயல்வார்கள். கம்யூனிஸ சோசலிஸ சிந்தனை வழியாக அதிக பணம் வைத்திருப்பவர்களை மிக அதிகமாக வரி போட்டு ஒழிக்கவேண்டும் என்ற சிந்தனையால் இந்திரா காந்தி 105 சதவீத வருமான வரி கட்ட சொன்னது ஞாபகமிருக்கலாம். அதாவது 10 லட்சத்துக்கு மேல் சம்பாதித்தால், 95 சத வீத வருமான வரி, அத்தோடு கூட 10 சதவீத உபரி வரி என்று விதித்து சாதனை படைத்தது இந்திராகாந்தியின் கீழ் பிரணாப் முகர்ஜி என்ற புத்திசாலி. அதனால், லஞ்சம் ஊழல் பெருக்கெடுத்து, அதிகார வர்க்கம் தலைவிரித்து ஆடியதுதான் மிச்சம். அதனை வைத்துக்கொண்டு மேலும் கம்யூனிஸ கும்பல்கள் அரசாங்கத்தையே ஒழிப்பேன் என்று கும்மி அடித்ததும் நாம் பார்த்தது. ஏன் கம்யூனிஸ கும்பல்களில் ஆட்கள் நிறைய சேர்ந்ததுக்கு காரணமே அரசாங்கம் கொண்டு வந்த செயற்கை வேலையில்லா திண்டாட்டமே. யாரும் தொழில் துவங்கக்கூடாது. தனியார் தொழில் துவங்க ஏராளமான கட்டுப்பாடுகள். அதனால் வேலையை உருவாக்க எந்த தொழில்முனைவரும் முன்வராததால் ஏராளமான வேலையில்லா திண்டாட்டம். அதனால் அரசாங்கமே வேலை கொடு என்று படித்த வேலையில்லாத இளைஞர்கள் ஊர்வலம்.. என்று நாறியது நாடு. Nepal Prime Minister GP Koirala must be ruing the day he allowed his Seven-Party Alliance to be conned into negotiating with Maoist leader Prachanda. Mr Koirala has given respectability to a bunch of armed thugs, agreeing to bring them into an interim regime and allowing them to dictate an interim Constitution along with the timetable for the election of a new Constituent Assembly to decide the monarchy's future. Unease over the implications of such fundamental changes in the Nepalese civilisational template are now spreading, as evidenced in the rise of pro-monarchy sentiment. The suspicions are not misplaced. The December 18 wildcat strike in which Maoists unleashed six hours of terrible violence in Kathmandu to protest against the appointment of envoys to 14 countries, indicates that Prachanda intends to dominate the Himalayan kingdom through the barrel of the gun. Any doubts on this score were settled three days later when 5,000 armed rebels walked out of their camps in Ilam and Morang districts in a show of strength that rattled the aged SPA leaders, who have realised that the forces that instigated them to unseat King Gyanendra have used them like a railway service to reach another station. Those forces want the political dominance of Prachanda through the 'good offices' of an obliging United Nations, which helped the US break up Indonesia and create Christian East Timor. Their success is likely because of Ms Sonia Gandhi's total commitment to the intrinsically anti-Hindu Western agenda. Thus, a civilisationally Hindu India has abandoned a civilisationally Hindu Nepal, because a White Christian dominates an effete Indian Government and wants to help a covert Christian illicitly ascend the throne of Nepal. Like India today, Nepal tomorrow will have a ruler who does not share the dharma of the people and does not respect their traditions and culture. Unlike Ms Gandhi, Prachanda is an ethnic Nepalese, but his ascension puts Nepalese civilisation in peril. The Bharatiya Janata Party, which has finally got its national agenda together under the promising leadership of Mr Rajnath Singh, would do well not to neglect developments in our neighbourhood. Prachanda is pressurising Mr Koirala to implement the interim Constitution in just 10 days, dissolve the SPA and form an interim Government with Maoist participation, failing which he will unleash mayhem in the Himalayan nation. Under the November 21 peace accord, Maoists agreed to confine their cadres to 28 camps and lock up their arms under UN supervision. But the sudden violence of the past few days prevented a UN-Maoist joint monitoring team from beginning inspections, and now reports of extortion and intimidation are pouring in from all over the country. The most bizarre aspect of the truce is the SPA's agreeing to let UN monitor the arms of both the Maoists and the Nepal Army, putting the nation's legitimate security force on equal footing with a gangster mob. There is no justice in the demand to confine the Nepal Army to barracks, and obviously a dubious foreign hand is behind this mischief, which will deny Nepalese village folk the sense of security needed to vote freely in the elections. Elimination of the Nepal Army from the national scene will give the Western-dominated UN a free hand to do as it pleases in the polls, a situation New Delhi must resist. India's Election Commission will not be able to ensure free and fair elections there unless the Nepal Army or the Indian Army keeps Maoist arms and cadre under lock and key; by current estimates Maoists can win just about 10 out of 205 seats in a fair election. The UN must either be kept out or its mission manned exclusively by adherents of non-monotheistic faiths. As the main Opposition party, the BJP must speak up for the civilisational integrity of Nepal and resist Ms Gandhi's subversion of our traditional foreign policy. Given the steep rise in conversion activity in India since Ms Gandhi's ascent, the BJP would do well to scrutinise missionary activism among the capital's Nepalese population as well. According to reliable sources, Maoists in New Delhi have close links with Christian groups. In Baljit Nagar, Moti Bagh and Mehrauli areas, secret churches have been established in houses occupied by Maoists. One church, with a banner proclaiming 'World Unification Movement', was visited by an unidentified White man who spoke about the political situation in Nepal. Sources suggest the gentleman could be from the US-based Republication International Movement (RIM), which is active in Asia. This seems likely because a Meerut school, Thomas Child Academy, which is caring for the orphan children of Nepalese Maoist cadre, is known to display the RIM flag on occasions. Nearly 100 Nepalis have been provided employment in Indian churches and are luring fellow Nepalis to the congregations every Sunday, where the Maoist newspapers, Dishabodh and Dishanidesh, are distributed free. A Nepali attending a meeting was shocked to see the pujari of the Nepali mandir in Baljit Nagar, Mr Puran Sharma, who is close to the Maoists, leading Christian prayers in Moti Nagar! This kind of subterfuge permeates the movement. While second-in-command Baburam Bhattarai and his family are openly Christian, Prachanda does not proclaim his religious affiliations but his wife's entire family is Christian. His guru, Chandra Pradesh Gajurel, was a Christian preacher. Sources estimate that the 42,000-strong Maoist army would be 30 per cent Christian, but the cadre are kept in the dark that the top leadership is predominantly Christian. Nepal's temporary Constitution recognises all religions, but Hindus are apprehensive about the changes desired by the rebels. A US-based organisation, Global Recordings, has intensified its conversion activities and is propagating the Gospel in all tribal dialects. Nepalis ask that if the Maoists are not Christian, why would they attack and close down all Sanskrit pathshalas (only a couple survive) and stop compulsory Sanskrit education in school? There is harassment at Hindu festivals and Brahmins have been forced to eat beef; who would kill the cow in a Hindu kingdom? Then there was the attempt to make the rhinoceros the state animal, instead of the holy cow. Unnerved, religious groups want Nepal to be declared a Hindu state again, and to retain the Hindu King, a demand India should heartily support in its own interests. சென்றவாரம் நேபாள் கிறிஸ்துவ எவாஞ்சலிகல் கூட்டத்தில் குடும்பத்துடன் பிரசண்டாவும் பட்டாரையும் கலந்துகொண்டார்கள். காசு கொடுக்கும் இடத்துக்கு சலாம் வைப்பது என்ன புதிய விஷயமா? மதம் மாறினாலும் ஜாதி பாசம் போகாது போலிருக்கிறதே.